To Stephanie’s surprise, Taylor Swift took her back to her her dressing room where she they had a little conversation to make Stephanie’s day. ‘Tis the season to be kind and generous. There’s one celebrity who has a track record in that arena that knows no boundaries. 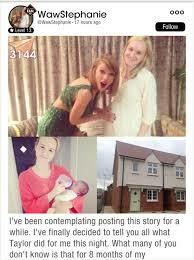 That’s Taylor Swift, who’s known for granting her fans all sorts of wonderful wishes. The latest perhaps being one of the most heartwarming of all. According to People, a fan named “Stephanie” described on the new The Swift Life app what the superstar did for her this year. Stephanie was 8 month pregnant when she became homeless. Their flat was condemned for health and safety reasons. To add to her stress, during these difficult times, her partner Matthew lost his job. Stephanie’s mother managed to get to Swift and tell the singer of her daughter’s predicament. Her mother got in touch with Taylor Swift through the Swift Life App. Asking Swift to just make her daughter feel special at the concert that Stephanie was going to attend in Manchester. If only, to put a smile on the Mother-to-be’s face.